Whether your lack of Irish heritage has left you green with envy or you have your leprechaun costume ready to go, we can all get into the St. Patrick’s Day spirit thanks to some of our tastiest creations! From our Pistachio flavored Iced Coffee and Mint Hot Chocolate, to Baskin-Robbins’ customizable St. Patrick’s Day Cake, we’ve got all things St. Patty’s Day totally covered! Here in Boston, we love to celebrate by going to the annual St. Patrick’s Day Parade. It’s an exciting, shamrock-filled event, and the streets are green as far as the eye can see. Since March isn’t the warmest month around here, Mint Hot Chocolate is a great way to stay warm and keep your taste buds happy. Looking for a more creative way to incorporate this flavor into your St. Patty’s Day celebration? Try making Chef Molly’s Brownie Pancakes topped with Dunkin’ Donuts Mint Hot Chocolate Ganache recipe from last year! Before we all get too excited, though, we’re going to need some green treats to fuel up for Thursday. To do this, our very own Chef Molly incorporated our NEW Pistachio flavored Iced Coffee into a Blondie recipe for a St. Patrick’s Day twist on a classic treat. This simple and delicious dessert will leave you feeling so festive that we bet you’ll be Irish step dancing your way through the rest of the week! In a large bowl, combine the cake mix, oil, egg and Dunkin’ Donuts Pistachio flavored Iced Coffee until smooth. Spray a 9”x9” pan with non-stick spray. Spread batter into the pan and bake for about 15 minutes or until golden brown. 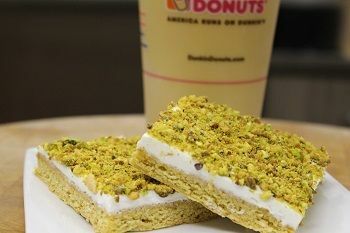 Cool completely and top with frosting and pistachios. Did I mention you can also score some cash from Dunkin’ tomorrow? We’re spreading the luck of the Irish to five guests around the country with our “Win Some Green” promotion. Those five guests will each win $1,000 - talk about finding a pot of gold at the end of the rainbow (or at your local Dunkin’ counter)! There is no purchase necessary and the program is open to legal U.S. residents residing in the fifty (50) United States and the District of Columbia, who are eighteen (18) years of age or older. For additional terms and conditions related to Dunkin’ Donuts’ “Win Some Green” promotion, please visit: http://dun.kn/1S2qACU. If you’re looking for yet another way to celebrate this fun holiday, look to our sister brand, Baskin-Robbins, who’s created yet another fun holiday iced cream cake, the St. Patrick’s Day Cake! 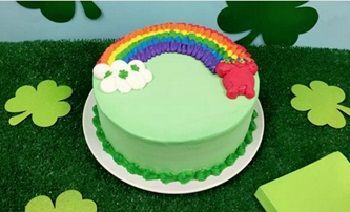 You can choose your favorite ice cream and cake flavor combination, and they’ll decorate it with green icing and a rainbow leading to a pot of gold. It doesn’t get more festive than that! Show us how you’re celebrating on Facebook, Twitter and Instagram! 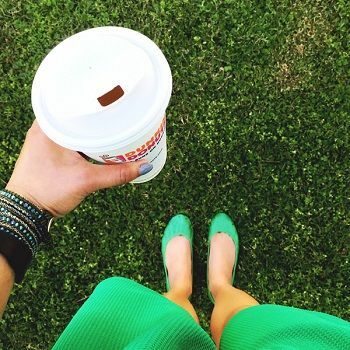 And who knows, maybe you’ll even be $1,000 richer after your St. Patrick’s Day stop at Dunkin’!